Win-IN: Coming up very quickly - 12 Regional Rallies and another Pro-EU Gathering in Winchester! Coming up very quickly - 12 Regional Rallies and another Pro-EU Gathering in Winchester! 14 October is the day of the nationwide regional rallies run by the 48%. 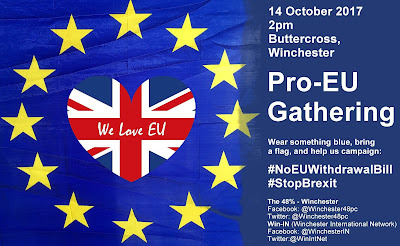 In the spirit of this, Win-IN and The 48% - Winchester are going to have another Pro-EU Gathering in Winchester, with some help by the European Movement! Please join us on 14 October for an hour at 2pm at the Buttercross to get some signatures for the #NoEUWithdrawalBill campaign run by Best for Britain.